Peter Benchley, author of the book that inspired the movie Jaws, was well aware that sharks have a public relations problem. He spent many years combatting the misconceptions that have made shark conservation such a tricky issue—namely, the idea that all sharks are giant, ruthless killing machines intent on attacking every human they encounter. This is such a pervasive image worldwide that it’s a difficult one to dislodge, though, as Benchley himself once remarked, sharks are victimised by humans far more often than humans are victimised by sharks. 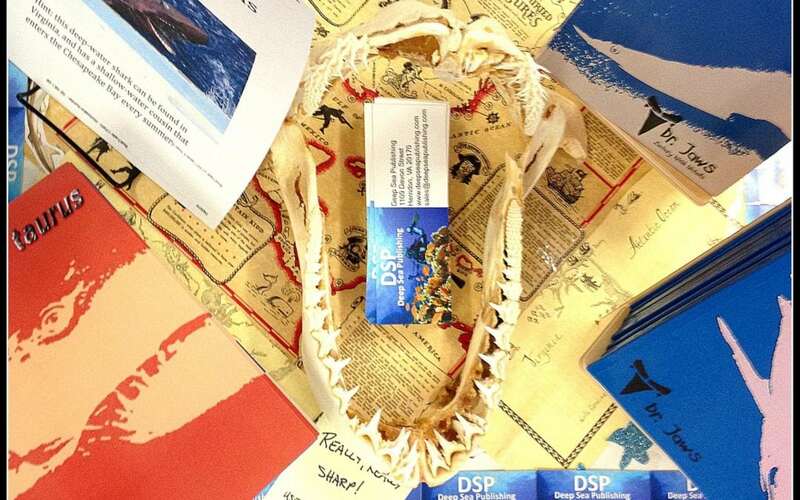 The late author would no doubt have approved of a new series of books, created by the “hybridist author” Dr Jaws, which disabuses readers of these sorts of inaccuracies and celebrate sharks for what they are—beautiful and fascinating animals that are an important part of their ecosystem and key components of many cultures around the globe. The books contain art, poetry, infographics and fiction, collectively providing information on both the natural history and biology of each of the titular species. 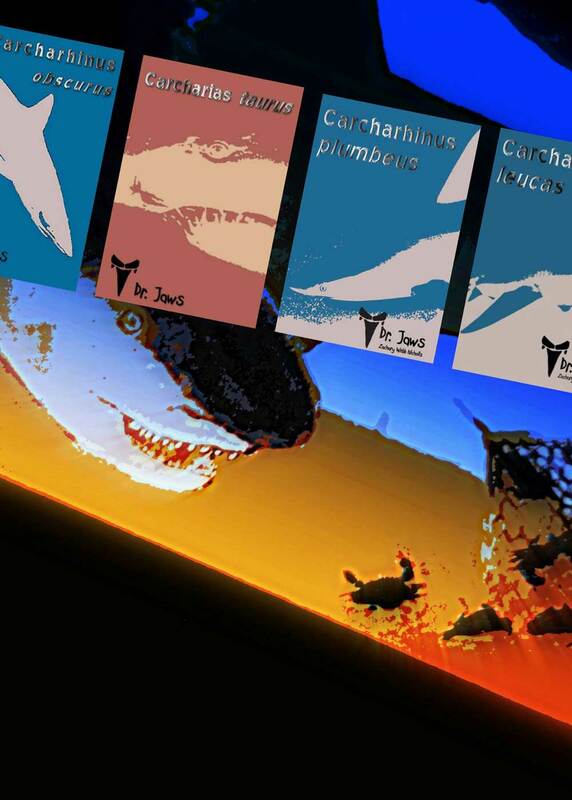 Four volumes have been published so far—Carcharhinus obscurus (dusky shark; 2013), Carcharias taurus (sand tiger shark; 2013), Carcharhinus plumbeus (sandbar shark; 2014), and Carcharhinus leucas (bull shark; 2014). Two more—Mustelus canis (dusky smooth-hound) and Squalus acanthias (spiny dogfish)—are due out later this year. Each of the books is approximately 50 pages long, and much of the text is printed in fairly large font; as a result, you could easily page through each installment within a half-hour. However, you could just as easily take twice that long if you sit and admire the colorful illustrations, ponder the imagery in the poems, or pause to work out the keyword cypher included midway through each book. You might even take longer if the tidbits spark your curiosity and inspire you to look up further details— perhaps to better understand intrauterine cannibalism, discussed in Carcharias taurus, or maybe to learn the other three sharks included in the “Fatal Four” mentioned in Carcharhinus leucas. 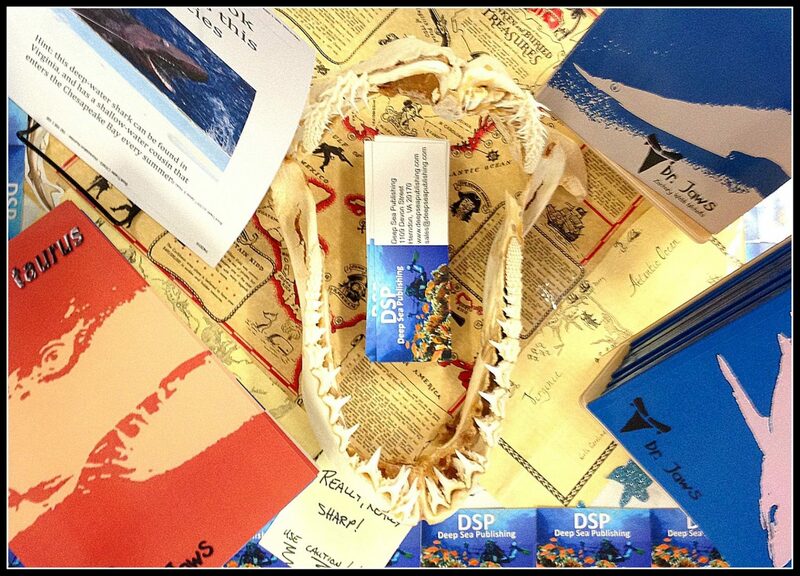 This kind of active engagement with the material is exactly what Dr Jaws—otherwise known as Zachary Webb Nicholls—has in mind; in the foreword to each volume, he encourages readers to do additional exploring outside the pages of the book, and promises that there is a wealth of information available to satisfy the appetite of any budding shark-lover. That information isn’t included in these volumes because they are intended to act more as an introduction—one aimed primarily at a younger audience. However, while Nicholls recommends the books for secondary school pupils, they could easily appeal to more mature readers in the same way that Finding Nemo is pleasant for both parents and their children. Some may find the mixture of art and science unconventional and unexpected, but the aesthetic appeal of the books is undeniable, and the author’s obvious appreciation for the focal species is infectious. Each volume ends with a call to “respect the seas and all who call them home.” Readers will surely be inclined to do so after reading Nicholls’ unique and thoughtful books, which make it clear that sharks are much more than merely a pair of jaws bristling with teeth.